Obsolete: An improvement, but more still to be done. Whenever the government hypes something up, you can almost guarantee that the end result will be less than the sum of its parts. So it is with the latest attempt by the Home Office to get to grips with something approaching an anti-terrorism strategy, which they have christened alliteratively pursue, prevent, protect and prepare, promoted heavily at the weekend by both Brown himself and Jacqui Smith. Using the protect word might well have taken something approaching balls: many minds still associate that with the ominous protect and survive booklets issued in the 80s, which matter of factly went through building a fallout shelter in the basement and wrapping up dead loved ones in black plastic bags, the eeriness and doom of the cartoons which accompanied the booklets still highly memorable now. While in the past such doommongering, both from politicians and police was regular, this latest document mainly eschews scaremongering, as have the politicians promoting it. With the exception of the potentially worse than useless training of up to 60,000 people in how to act should they suddenly find themselves in the middle of a terrorist attack, which in reality amounts to an around 3 hour seminar session for business people, which only seems likely to be quickly forgotten or alternatively make all those involved even more paranoid than they may have been, and the emphasis that has been put on the threat of some variety of "dirty" attack being launched increasing, it mostly keeps things in something approaching prospective. One of the first facts it points out is that over 3,500 people died between 1969 and 1998 as a result of "Irish-related terrorism", which is something well worth pointing out the next time someone tries telling you that the threat level posed by Islamic terrorists is far beyond that the IRA did; al-Qaida has after all as yet made no attempts whatsoever to murder political figures in the West, attempts on the life of former Pakistan president Musharraf not withstanding, while the IRA came incredibly close to killing much of the Thatcher government in Brighton in 1984. In fact, the thing that perhaps undermines the entire document the most is that the government is essentially being forced to admit that the threat level is actually diminishing. After years of telling us that things were getting worse, that the "sky was dark" and that an attack could happen at any time, back in January we had the head of MI5 admitting that al-Qaida had no semi-autonomous structure in the country at this time, and that rather than attacks being actively planned, they only had the "intention to launch an attack here". Partly this may well be down to al-Qaida having to re-examine exactly where it's going at this moment in time: with the "Islamic State of Iraq" all but defeated in that country, it being essentially flushed out of Saudi Arabia and with the only real encouraging signs for the organisation being the increased activity in places like Yemen, Algeria and Somalia, with there being a contradictory situation in Pakistan of the Pakistani Taliban increasingly in strength while the drone attacks have succeeded in killing many senior figures in the hierarchy, its supporters in Europe might well be their last concerns at the moment. 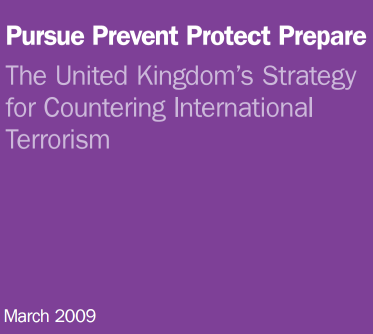 The document makes clear that should things continue the way they are, it may well be possible by next year to reduce the threat level, which has stayed at severe since 7/7 and gone up to critical on two separate occasions, to substantial. While the document then continues to claim that the main threat remains "al-Qaida central", i.e. the remnants of the original organisation now in hiding most likely in Pakistan, of increasing importance is the threat from al-Qaida's "franchises", such as the former Algerian Salafist Group for Preaching and Combat, now known after pledging allegiance to bin Laden as al-Qaida in the Islamic Mahgreb. Almost mentioned is al-Qaida in the Arabian penisula, despite its effective defeat, the aforementioned ISI and al-Qaida in Yemen. Perhaps most notable though is the new importance given to "self-starting" networks, or even lone individuals, motivated by the extreme salafist takfirist jihadist ideology, but whom have no connection whatsoever to al-Qaida central, such as Nicky Reilly. Mentioned last is groups that have a similar ideology to al-Qaida, but whom have their own identity and regional agenda, perhaps thinking of the likes of Lashkar-e-Taiba. The first part of the document is entirely given over to a narrative detailing the effective rise of international terrorism, from the initial actions of Palestinian groups and their attacks during the 70s, up to the founding of Hizbullah and finally the genesis of al-Qaida itself. Interestingly, it directly links the bombings in Istanbul in 2003 against the British consulate and a British bank to Abu Musab al-Zarqawi's organisation in Iraq, before his group had become part of al-Qaida, which is either new or something I had otherwise missed. This section doesn't tell you anything you probably don't already know, but for the government to be setting it out in such a way, and doing so matter of factly, without anything approaching spin, is itself a sign of progress, even if it is very much the establishment version of events. The part on radicalisation which follows on draws heavily on the leaked MI5 document on understanding extremism in this country. This made clear that there was no single underlying cause, while at the same time dismantling the myths that had built up that it was all the work of extremist preachers. The main threat remains the small groupings which build up, often around a charismatic local leader voiced in radical Islam, whose influence on those around him is worth about 10 of any radical on the internet. Our approach to national security in general and to counter-terrorism in particular is grounded in a set of core values. They include human rights, the rule of law, legitimate and accountable government, justice, freedom, tolerance and opportunity for all. This would be the same government currently up to its eyeballs in claims regarding security service collusion in torture of "terrorist suspects" abroad; which completely ignored the rule of law in detaining foreign suspects indefinitely without charged; which continues to defend the permanent deprivation of liberty associated with control orders as well as ensuring that those under them cannot properly find out what they are accused of or challenge that evidence; and which only gave in over extending the detention limit to 42 days after it became clear that it had no chance of pushing it through the House of Lords. If the government has any shame over any of this, it doesn't show it. Like the initial section of the report, the part on chemical, biological, radiological and nuclear (CBRN) weapons is a narrative stating the background. This mentions the Japanese underground Sarin attack, then goes on with claims on how al-Qaida has experimented with CBRN weapons, almost all rudimentary poisons. It details the alleged 2003 plot to release hydrogen cyanide on the New York underground, strangely called off by Zawahiri, and then less realistically lists good old Dhiren Barot's coke-can and smoke alarm bomb plans, which even if he could have got hold of the material involved would likely have been as effective as gas canisters to bring down buildings plan turned out in practice. For good measure it also lists the Islamic State of Iraq's experiments with including chlorine gas canisters with its suicide car/truck bombs, which is again about as rudimentary as you can get, and which they stopped doing some time ago. The three factors listed for the increased threat are "a significant increase" in the trafficking of such materials, that the internet has made information on them much more widely available, and that CBRN materials can be used for legitimate purposes, in case you didn't know. All round, this is pretty woeful stuff. As terrorist groups are incredibly unlikely to get access to enriched uranium any time soon, the main threat posed is from them combining machines from hospitals containing such materials with bombs, and letting the air do the rest of the work. The main threat from this would not be the material itself, but from the panic that would ensue and the subsequent decontamination. Even this has most likely been vastly exaggerated: even the polonium of the type which killed Alexander Litvinenko would be unlikely to kill many, if any, if used in a bomb. The document then mentions IEDs of the type constructed in Iraq and increasingly being used in Afghanistan, concerning the intent to "experiment with novel explosives". Discounting the combination of suicide bombs with chlorine, most of the explosives used in Iraq were actually old regime stockpiles which came in extremely handy, and which only in the last couple of years were exhausted, which itself has probably contributed to the drops in such attacks. The innovations have occurred in the ways in which to trigger them and to get around equipment which is meant to disarm them. Quite why it's even bringing this up is unclear: there have been no signs whatsoever that groups in this country intend to start making roadside bombs, and as the past few attacks have shown, explosives themselves are incredibly difficult to obtain, let alone to then use correctly. You have to wonder if the claims surrounding dirty bombs are ones which they know the media won't bother to investigate, and which instead turn on the horror reflex, hence the Sun's illustration to their report. With the threat diminishing, the unusual threats column is the only one remaining which they can highlight. While the government then deserves some acclaim for setting out clearly the origins of the threat, not dismissing out of hand the fact that foreign policy clearly has a distinct influence on it, and for also admitting that if anything it's diminishing, all signs that the spin and playing politics with terrorism which flourished under Blair and which continued for a time under Brown might now have finally been decided to have been counter-productive, more work is still needed on really getting to grips with the origins of extremism, while also not denouncing but challenging those that hold views which can be seen as stepping stones towards full-blown Islamic fundamentalism. Not overreacting stupidly to a dozen protesters at a homecoming parade would be a start, but to do that they would also have to challenge the media's completely unhelpful obsession with extremists under the bed, something they have shown no intention of doing. I am reminded of the time when all this kind of nonsense was generated in preparation for a nuclear attack. And the only sensible advice was to bend down put your head between your legs and kiss your arse goodbye. In this case, there is one p missing, ie, piss yourself.